Evolution of mobile app programming has been instrumental in taking the mobile apps to a new level with more usability in better UI and UX. Ever since mobile apps made its way among humans, it has been rampant and amazing in the way it has evolved. Humankind owes a lot of thing to technology especially mobile app programming as it has made several things easier, faster and accessible. Ever since mobile phone burst onto the scene for the first time, it has been the fulcrum to technology evolution and is taking giant strides with every passing day. Today, as programming constitutes the major part of it, the evolution of mobile app programming holds a major role in upscaling it and making what it is today. The biggest reason behind the improvement of Mobile app programming is the changing demands and the usage of mobile apps. In the initial years, it would take tons of code to design even a simple app like calculator or calendar (Yes Folks!! Calculators and calendars were considered as mobile apps in those times). Moreover, a singular code was dedicated to a singular app as those were times of Object Oriented Programming. Also, the fact that mobile technology has taken the world by storm due to its rapid evolution, it would not have achieved this, without the improvement in the style of programming. 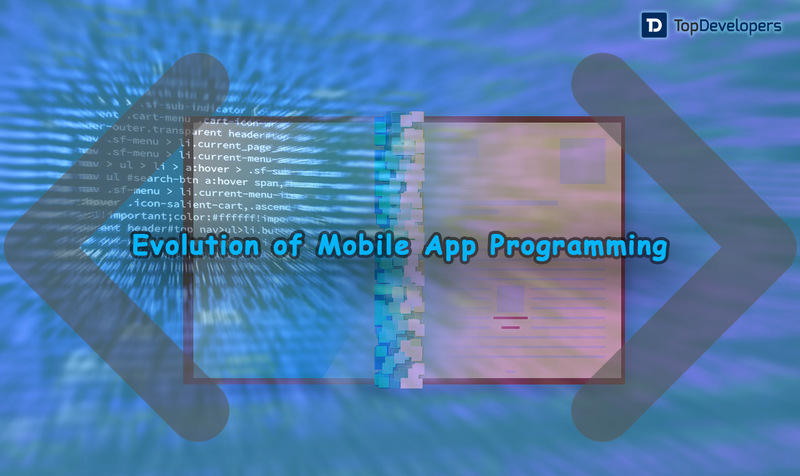 Therefore without much ado, let us have a detailed insight into the evolution of mobile app programming and see how it has positively affected the world. In the initial phase, the mobile apps were seen as nominal things and were doing only the basic functions like an alarm clock, setting the date and time, sending and receiving messages, etc. But ever since the world shifted to mobile technology after the burst of smartphones; the role of programming in mobile apps has also changed. The programming has become a lot better in terms of speed and providing accuracy to the users. The customers can accomplish multiple tasks simultaneously without any lag and that too with better efficiency. Now, with the increased accuracy, the mobile apps can be the perfect ally for research work and find relevant things on a more frequent basis which helps in achieving the desired ROIs. At the core, the group that has been at the receiving end of all these evolutions has been the customers. The comprehensive mobile app programming language has made the mobile apps worthy and efficient as a result it is proving extremely beneficial for the customers. They can do a plethora of work with a single app which was not possible a little while ago and also caters some important things through the app. Right from the things needed in daily life to the utility ones, mobile apps are ubiquitous and thanks to the marvelous programming technique are doing amazing work for the users. The advanced mobile app programming has made the apps capable enough to store huge amount of data for a long time in a synchronized manner. Unlike the past, mobile apps are now looked upon as a full-fledged option for business purposes and thus need high-end security. New age mobile app programming renders agile and well-structured security which is readily available for assistance as and when required. The programming advancement has also increased the encryption level within the app so that it is difficult for the intruders to figure what kind of data is being transferred through the mobile app and thus providing a sense of secured usage. Mobile app programming languages are certainly the heart and soul of the mobile app and its evolution means that the improvement of the mobile apps is headed in the correct direction. Developing the app with advanced programming helps in delivering the most optimum and just product according to the new age user requirements. Today, it will be a key factor in achieving the desired ROIs helping the company to expand in various directions.